It seems like everyone and their mother is talking about chia seeds these days. So you’ve probably heard about a bunch of benefits that they offer, and you decided to buy a bag or two to give them a try. Now that the package has arrived, you’re wondering for how long you can store the seeds, or how to tell if they are spoiled. Or whether or not they can go bad at all. All of these are fair questions, but most sites that talk about various benefits of consuming chia seeds rarely answer these. In this article, we talk about going bad, shelf life, and storage of chia seeds. 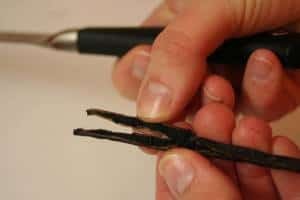 If you know all about the benefits and ways of preparing these seeds but aren’t as knowledgeable about the basics, this piece is for you to bridge that gap. But before we get started, let me answer one of the popular chia-related questions: what’s the difference between black and white chia seeds? The difference is close to none ([VK]), and there’s no point in caring about it. So choose the color depending on which one suits your recipes better or is available. Can Chia Seeds Go Bad? How To Tell They Are Bad? You most likely already know that chia seeds are high in antioxidants. That means that even though they contain a lot of oil, like pretty much all seeds (e.g., flax or sesame) do, they aren’t don’t go rancid quickly. In other words, they will last a really long time before they go bad. Or rather before their quality becomes bad enough for you to decide to toss them out. Nevertheless, there are some telltale signs that your chia seeds are past their prime. Like with other oil-rich foods, you’re looking for signs of rancidity, both in taste and smell. 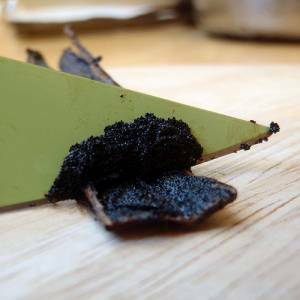 But it’s most often not as easy as giving the seeds a good whiff before using and being observant of any taste changes. Chias don’t have a very distinct smell, maybe some nutty notes, but that’s it. And once the oil turns rancid, it most likely won’t make the seeds smell sour, at least not right away. To fix that, crush some seeds using a mortar and pestle and give it a sniff. If the smell is stale or rancid, throw them out. 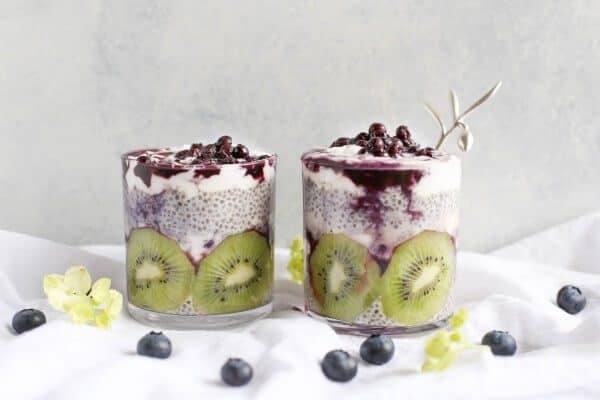 When it comes to taste changes, they might be difficult to spot because in most cases we use only a small amount of chia seeds in a recipe. 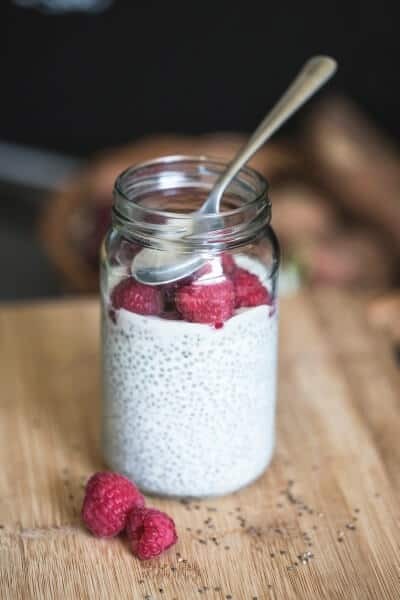 If you’re making your chia pudding with milk, some fruits, and nuts, it’s nearly impossible to note that those chia seeds are off. To get around this issue, soak some in water and check how they taste like. If the taste is off, discard them. Both of the described methods of checking for spoilage are a bit time-consuming. But if your seeds are past the date on the label, and you still want to use them, take the time to check the seeds every couple of weeks. And speaking of dates, let’s talk about the shelf life of these seeds. Long story short, it depends on whom you ask ([MC][VK]). The best-by dates on labels tend to be at least a year, maybe 18 months of the packaging date. The safest way to go about this is once the seeds have passed that date, check them for spoilage every few weeks if you want to keep using them. Chances are they will last in good quality far beyond what the package says. And by far beyond I mean months, or even years. Of course, most producers simply recommend to discard the leftovers after the date on the label, but I personally feel that’s wasteful. And I’m pretty sure you feel the same way. How To Store Chia Seeds? Chia seeds don’t have any special needs when it comes to storage. Just keep them in a cool (not necessarily cold), place away from sunlight and sealed tightly. That means a cabinet in the kitchen is perfectly fine. Once you open the container, make sure it’s always sealed when not in use. So if your bag isn’t resealable, it’s best to transfer the seeds to one that is. You can use freezer bags, airtightly containers, or glass jars, whatever works for you, really. A tight seal will keep any moisture at bay, and prevent access to fresh air, helping the seeds maintain quality for a bit longer. 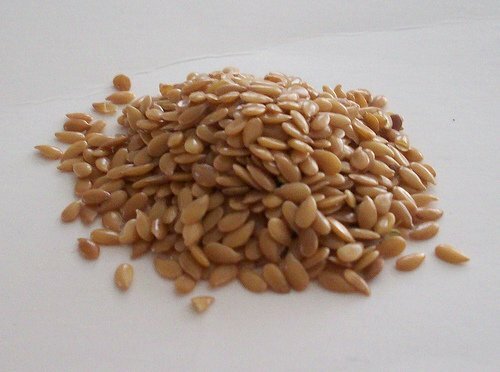 When it comes to refrigerating the seeds, feel free to do that, but it doesn’t come with any tremendous benefits and it’s not required ([MC]). The seeds will stay fresh for a bit longer, but that’s about it. If the fridge is your storage place of choice, make sure the seeds are well sealed, so they don’t pick up any moisture from the environment. Chia seeds often last months past the date on the label. To check for rancidity, crush the seeds with a mortar and pestle and smell it, or soak in water and taste. If in either case you find the seeds stale, rancid, or sour, discard them. Keep the seeds at room temperature, refrigeration isn’t required by any means. [MC] Mamma Chia: What Do Chia Seeds Do? With the popularity of gluten-free diet on the rise, quinoa has become an alternative to grains such as wheat, rye, and barley. 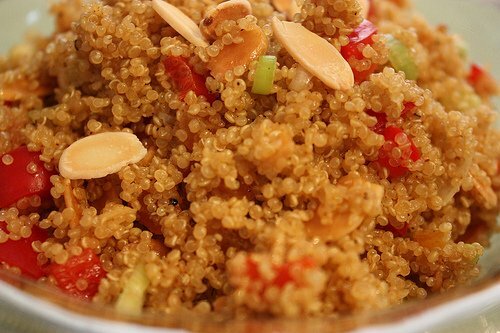 Surprisingly, quinoa is not a grain although it is often enjoyed as such. Quinoa is a high-protein seed that’s high in essential nutrients. These nutrients include vitamin B, iron, lysine, magnesium, riboflavin and manganese. On top of that, quinoa contains all 9 amino acids that promote better muscle health! Since this product is gluten-free, people with gluten sensitivities or celiac disease can consume quinoa safely. But what about the storage life of quinoa? Can quinoa go bad? As with all types of fresh produce, yes, quinoa will go bad at some point. That being said, it will take a while before quinoa goes bad completely. Just make sure to protect the product from moisture and high heat to extend its shelf life! Quinoa is sold dry so it has a long shelf life. However, it is not impervious to spoilage. In fact, quinoa has an extremely long shelf life! As long as you keep the product away from sources of heat and moisture, it should keep for a long, long time. What you need to watch out for is mold growth. Once there is a presence of mold, you have no choice but to discard the product. And quinoa isn’t exactly cheap so proper storage is a must to maximize your supply! It’s hard to tell if uncooked quinoa has gone bad simply because there will be little to no changes in its color or flavor. For uncooked quinoa, give the product a whiff prior to cooking. If there’s a slight change in its texture or aroma, the product might’ve gone bad. The only time you can tell if the product has gone bad is if you cooked it. If the cooked quinoa has an abnormally hard texture or if it starts emitting a funky aroma, the product is no longer safe to eat. If the cooked quinoa has turned moldy, toss the product in the trash. 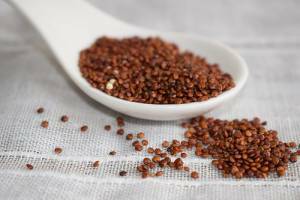 Storing quinoa will depend on the state of the product prior to storage. For uncooked, unopened packs of quinoa, you can store the product in the pantry at room temperature. The packaging provides enough protection from the elements. However, keep the quinoa away from sources of moisture and excessive heat to extend its shelf life. For uncooked, opened packs of quinoa, keep the product in the fridge. Refrigeration will extend the shelf life of the product. Keeping the quinoa in the fridge also delays the degradation of the product! Refrigeration is the best way to store quinoa that’s nearing its expiry date. Cooked quinoa will go bad within a few hours so it is important to refrigerate the product in airtight containers. You can also freeze the leftovers if you have no plans of consuming the cooked quinoa right away. However, expect significant texture change once the frozen quinoa has been thawed and reheated. When kept in the pantry, uncooked and unopened packs of quinoa will keep for 3 to 4 years. Opened packs of quinoa kept in the fridge will stay fresh for 2 to 3 years. Cooked quinoa will stay fresh in the fridge for 5 to 7 days. When kept in the freezer, quinoa will keep for a year or more if the temperature is at a steady 0 degrees Fahrenheit! Yes, you can freeze uncooked and cooked quinoa to extend its shelf life. Just use an airtight container to store the product, no additional prep needed. For unopened packs of uncooked quinoa, just stick the product in the freezer, original packaging and all. As you can see, quinoa is not just a versatile product, it is also easy to store for later use! Quinoa is quite pricey so proper storage is a must to avoid wasting product. Just keep these tips in mind to extend the shelf life of quinoa!